to have fun and exciting adventures with your friends. We endeavour to make our tours as memorable and exciting as possible whilst also respecting and caring for the environment. We prefer to take small groups (maximum 7 persons) on our tours so that it is more personalised and we are able to properly get to know our guests. We avoid crowded, touristic places more so than we do our own dentist. Each tour that we offer has a high degree of flexibility so that it can be tailored to the individual needs and requirements of our guests. We prefer dusty, 4WD tracks to sealed roads. We would rather have a sit down lunch under the Karri trees whilst listening to the local wildlife than in a fancy restaurant. We prefer running into pods of dolphins or mobs of Emu’s rather than other tour groups. We love taking families with young kids on adventures and get a great thrill out of seeing the excitement on their faces when they roll over a log on the mountain bikes, catch a wave in the surf or navigate their way around a snag whilst kayaking the river. At Surf N’ Dirt Adventure Tours a healthy and adventurous lifestyle means everything to us and we would love nothing more than to show you around one of the most pristine and beautiful regions on the planet. 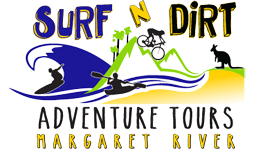 A Surf N’ Dirt Adventure Tour will fulfill your adventure needs, inform you about the Margaret River Region and have you departing with a full memory bank of amazing experiences and a new bunch of friends. Come along on one of our tours today to discover what it is all about!